Isn't Orbital's NMD booster pretty much a Pegasus XL without wings? Not at all. Is it more similar to the Taurus, or are they all completely different from each other? Need I go on again? Note from these two examples that when someone claims that the growth from, say, a Falcon 1 to a Falcon 9 is a simple path with no risk, they're either extremely naive or blowing smoke. These changes weren't made for the sake of making changes (keep in mind that Taurus was internally funded, so it wasn't a case of feeding off the government), there were real technical reasons. An interesting read on Loral's history. Bernard Schwartz should've stuck with defense! You forgot their concern about the quantity of gaseous nitrogen that we were using... what would happen if all that nasty gaseous nitrogen were to be suddenly released into the delicate Santa Barbara County environment? Sky is NOT the limit !! You did the right thing; money helps, don't get me wrong, but there are more important things in life. Don't forget that they were also concerned about the condensate that would be generated by the payload environmental control unit and originally wanted that WATER collected and processed as a hazardous waste! Where is the OSC pad at VAFB? Is that the SLC 8 ? Pegasus does not use a "Launch Complex" - the L-1011 simply lands at the old shuttle runway, the LV is trailered in, and mating and final pre-takeoff preparations occur at the taxiway near the RW30 departure end. Taurus uses a plain concrete pad in the area historically known as "LC-576E", a series of about 11 abandoned pads, silos, etc. that were used from 1959 to the mid 60's for the Atlas LV, in its various forms. The pad Taurus uses actually surrounds a silo that was once used for the testing of silo-protected Atlases (remember?...) so we have to be very careful were we step. 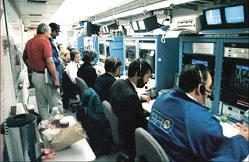 There are no "facilities" per se at the site: Taurus brings everything it needs, down to the trailer-mounted Launch Control Room. Setting up the (buried) fiber optic line from the pad instrumentaiton box to the trailer some 3 km away was quite an adventure, given the indian burial sites that dot the landscape of the former Navy gunnery range that is today VAFB. Here's a picture of a Taurus on the pad. Note the fencing around the old silo. Everything is road-transportable, including the launch stool. The "umbilical tower" is, of course, single use... (aero313: can you verify all of this? My memory is not that good...). BTW I can post these pictures because I used them at a "Responsive Space" (ha!...) conference in Long Beach a few years ago, so it has been shown to the public. The Minotaur launches to orbit from VAFB use SLC-8, which the team considers "luxurious accomodations" :laugh: Note in the linked pictures the use of the same expendable tower as taurus.